Peru's Supreme Court Overturns Pardon Of Former President Alberto Fujimori The high court overturned a medical pardon for Fujimori on Wednesday. It ordered his return to jail to serve out a sentence for human rights abuses. 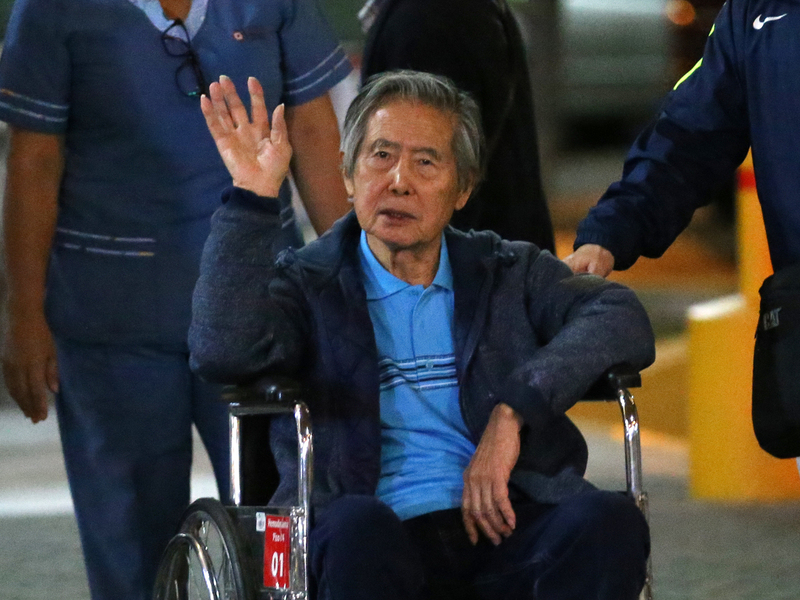 Peru's former President Alberto Fujimori waves to supporters as he is wheeled out of a clinic in January after receiving a "medical pardon." Fujimori was sentenced to 25 years in prison for 25 death-squad killings and two kidnappings in 2009. The court handed down what amounted to a life term to the then-70-year-old. Instead, Fujimori was pardoned in December 2017 by Pedro Pablo Kuczynski, Peru's president at the time. Kuczynski, who campaigned on an anti-Fujimori platform, cited the former president's degenerative disease in issuing the "medical pardon." However, the move by Kuczynski, who was facing possible impeachment at the time, was viewed by many as an attempt to solidify support by currying favor with Fujimori's political allies. As NPR reported, the pardon sparked widespread protests. Keiko Fujimori, daughter of Peru's former President Alberto Fujimori, cries as she speaks with reporters outside her father's home in Lima on Wednesday. Now the court is calling for Fujimori's immediate detention. The ailing ex-president shared a video of himself on Thursday, asking to stay in his clinic to receive treatment. "Please don't kill me," he said. Reuters reports that Fujimori's attorney filed an appeal of the decision and requested a suspension of the arrest order. 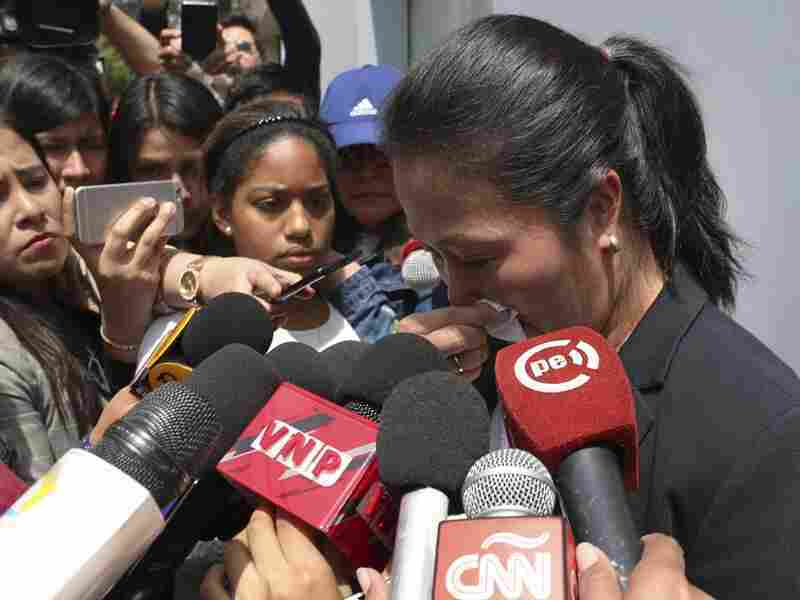 Fujimori's daughter and current leader of the powerful conservative Popular Force party, Keiko Fujimori, described his words as a call of justice. She wept as she talked to reporters on Wednesday. "Today is one of the saddest days in my life," she told a group of journalists. After winning the 1990 presidential election as a political outsider, Fujimori began a 10-year rule at a time when left-wing guerrilla groups, such as the Shining Path, were active and inflation was rampant. He began an authoritarian rule after suspending the country's constitution in 1992. Fujimori restored the constitution in 1995 and won another term but resigned from office in 2000 after multiple corruption scandals and rumors of sanctioned death squads. He fled to Japan, his parents' birthplace. In 2005, Fujimori stunned supporters and rivals alike by flying to Chile. After 22 months in the neighboring country, he was extradited to Peru. At a subsequent trial, Fujimori was found to have ordered a death squad to kill partygoers, including an 8-year-old, at a neighborhood gathering that was falsely rumored to be associated with a leftist guerrilla group. Polls showed most Peruvians were in favor of the 2009 verdict, but Fujimori has remained revered in the eyes of some for curbing the Shining Path, responsible for nearly 70,000 deaths between 1980 and 2000. The former president has 14 years left on his sentence. He has not yet started the rest of his jail time.